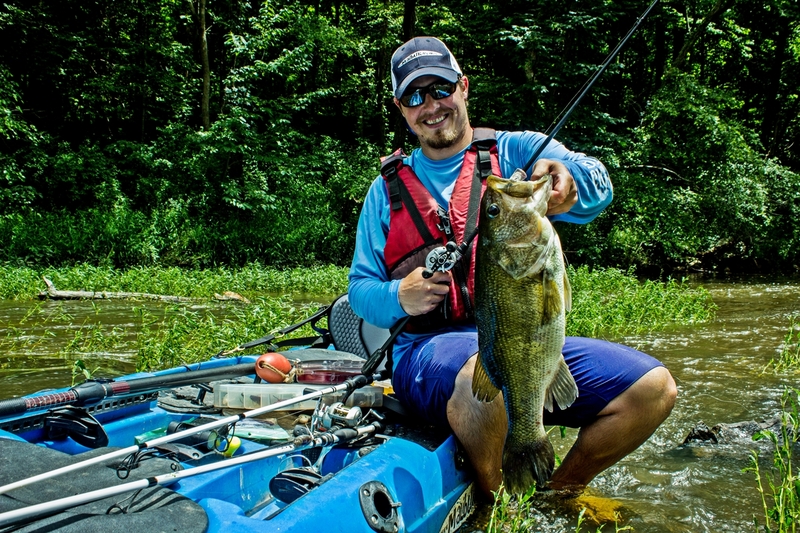 It has never been a secret that I love fishing small flows and targeting big bass. 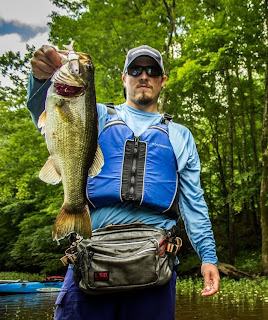 A couple of years ago, I put together a short article about fishing creeks and small rivers. I also have a popular video - Gone Creekin' - on my YouTube channel. And a few weeks ago I blogged about catching bass in high, muddy water and detailed some of my small river successes. It is weird because I went from cursing the rain to crossing my fingers that we get more every time I see the river gauge drop below a certain level. The even crazier thing is that level is roughly 2 feet above normal for this time of the year. These conditions have forced me to adjust, learn new patterns, and find new areas on some of my favorite flows. But this past week, it paid off again. I had another mid-week guide trip with a father and son and I really wanted to put them on fish. Everything was muddy and blown up, limiting my options. They also didn't want to go too far from home, which limited the places we could go even more. I decided on a river that I knew would fit my high, muddy water pattern. The gauge read 3.1 feet above normal when we launched. It was a little higher than I wanted, but definitely doable - at least I hoped so. Long story short, they landed some nice bass, pushing 4 lbs, and chunky catfish. We again targeted eddies and grass lines with crankbaits and spinnerbaits. The Premier League Lures River Series spinnerbait was the star of the day. It was a really fun day on the water and the Malibu Stealth 12 did great with the son riding up on the front. In fact, he walked all over that kayak without a problem as we paddled and fished. When I got home, I again looked at the river gauge. It had actually risen about 6-8 inches while we were out there. Rising water conditions are not my favorite and that may have hampered the bite. Looking back at some of my fishing logs over the past few years, even if all other conidtions were ideal, I have consistently done better in falling water than rising. Keep that in mind when planning your next trip because even within a watershed, tributaries and different parts of a river will rise and fall at different rates. The USGS river data site is your friend! 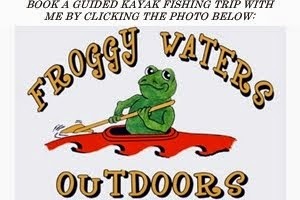 Froggy Waters Outdoors has been a lot busier this year, limiting my personal fishing trips. And although I don't get to actually fish very much, they are great scouting trips for when I do get to go chase some bass on my own. This past Sunday was finally one of those days. I turned 30 on Friday and got to celebrate with great friends and food well into Saturday morning. I woke up Saturday afternoon (yep, afternoon) feeling every bit of 30 after 3 late nights in a row, but was excited to have my good friend Bill Kohls coming into town to hang out, hit the water, and take some photos for some companies he is working with. A huge thanks to him for the shots from Sunday! 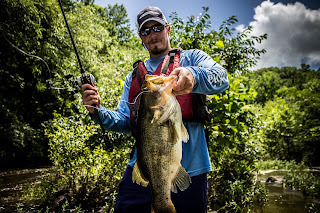 We launched around 9 AM on another local river that was about a foot and a half above the median level for early July. After some failed exploring down river, we turned around and headed toward some shoals. Bill lost a bass on a crank, but the bite remained slow. We were fishing weed lines, eddies, chunk rock, wood cover, and chutes with no luck. Finally, we came to a rock bluff with a chute and long eddy. Bill was throwing a swim jig and nailed bass on back-to-back-to-back casts along a grass line. The third bass ripped his trailer off the hook, so while he grabbed a new one, I stepped up to the plate with a crankbait. I didn't get them on simultaneous casts, but I had three bass of my own in no time at all, including one long bass that was over 4 lbs. That brings me to another crazy thing about this year so far - I haven't even been photographing 4 lbers because I have been catching fish over 5 lbs on every trip, often more than one. It has just been insanely good. We rotated between cranks, the swim jig, swimbaits, jerkbaits, and spinnerbaits and landed a dozen fish from that short stretch of water. We kept moving up-river. Some spots we passed looked perfect, but we couldn't buy a bite. We fished on, eventually getting to another quality area. I hit three quick bass on a crank and Bill lost one on a jig. I switched up my bait to a crank that dove a little deeper and 5 casts later the bait got crushed. I saw the fish flash and it looked big, but in the muddy water it was impossible to tell how big it actually was. She ran past the yaks and down river before going aerial. We knew it was a good one, although I still didn't think it was bigger than 5 lbs. Pulling drag along the way, she eventually got closer and jumped again. This time, we knew it was a special fish for such a small flow. I was able to turn her in the current with my 7'6" Carolina Custom Rod and get her in the net. Her body was every bit of a 7 lber, but immediately, we both noticed that she was on the short side. We snapped a few photos and got some measurements. She pulled just under 6.5 lbs on the scale and I would guess she was in the 21"-22" range. We went on to catch 6 or 7 fish on Rico poppers, cranks, and jigs up to that weighed up to about 3.5 lbs. One thing I noticed again on Sunday is that the rain has kept the water cooler than normal and flat sided cranks are significantly outproducing square bills and cranks with a wide wobble. Keep that in mind next time you pull out a crank in cooler water. Eventually, the heat started getting to us, so we floated back down river to the launch - catching a few more along the way including a chunky bass Bill caught on a jig. 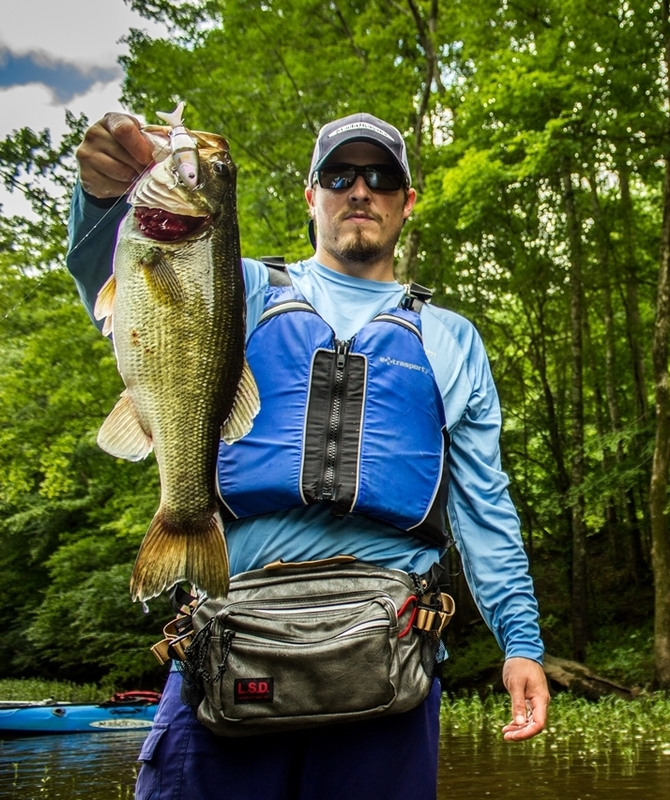 Given the conditions, we certainly couldn't argue with over 20 bass up to 6.5 lbs. I just can't get enough of these wet conditions! Until next time, tight lines! Awesome fish Drew, you've earned it through paying your dues brother.